Manoj Nelliyattu "M. Night" Shyamalan[a] (/ˈʃɑːməlɑːn/ SHAH-mə-lahn; born August 6, 1970) is an American filmmaker and actor. He is known for making films with contemporary supernatural plots and twist endings. He was born in Mahé, Puducherry, India, and raised in Penn Valley, Pennsylvania. Shyamalan was born in Mahé, a town in the Indian Union Territory of Puducherry, surrounded by the state of Kerala. The son of Indian parents, his father, Dr. Nelliate C. Shyamalan, is a Malayali neurologist from Mahé and a JIPMER graduate, his mother, Dr. Jayalakshmi, an ethnic Tamil, is an obstetrician and gynecologist. Shyamalan's parents immigrated to the United States when he was six weeks old. Shyamalan was raised in his hometown of Penn Valley, Pennsylvania. Shyamalan was raised Hindu. He attended the private Roman Catholic grammar school Waldron Mercy Academy, followed by the Episcopal Academy, a private Episcopal high school located at the time in Merion, Pennsylvania. Shyamalan earned the New York University Merit Scholarship in 1988. Shyamalan is an alumnus of New York University's Tisch School of the Arts, in Manhattan, graduating in 1992. It was while studying there that he adopted "Night" as his second name. Shyamalan had an early desire to be a filmmaker when he was given a Super 8 camera at a young age. Though his father wanted him to follow in the family practice of medicine, his mother encouraged him to follow his passion. By the time he was seventeen, the Steven Spielberg fan had made forty-five home movies. On each DVD release of his films (beginning with The Sixth Sense and with the exception of Lady in the Water), he has included a scene from one of these childhood movies, which he feels represents his first attempt at the same kind of film. for The Happening in 2008. Shyamalan made his first film, the semi-autobiographical drama Praying with Anger, while still a student at NYU, using money borrowed from family and friends. He wrote and directed his second movie, Wide Awake. His parents were the film's associate producers. The drama dealt with a ten-year-old Catholic schoolboy (Joseph Cross) who, after the death of his grandfather (Robert Loggia), searches for God. The film's supporting cast included Dana Delany and Denis Leary as the boy's parents, as well as Rosie O'Donnell, Julia Stiles, and Camryn Manheim. Wide Awake was filmed in a school Shyamalan attended as a child and earned 1999 Young Artist Award nominations for Best Drama, and, for Cross, Best Performance. Only in limited release, the film grossed $305,704 in theaters, against a $6 million budget. That same year Shyamalan co-wrote the screenplay for Stuart Little with Greg Brooker. In 2013, he revealed he was the ghostwriter for the 1999 film She's All That, a teen comedy starring Freddie Prinze Jr. and Rachel Leigh Cook. However, this statement has come into question as the credited screenwriter for the film, R. Lee Fleming Jr., denied Shyamalan's involvement in a now deleted tweet. Shyamalan gained international recognition when he wrote and directed 1999's The Sixth Sense, which was a commercial success and later nominated for six Academy Awards, including Best Picture, Best Director and Best Original Screenplay. In July 2000, on The Howard Stern Show, Shyamalan said he had met with Steven Spielberg and was in early talks to write the script for the fourth Indiana Jones film. This would have given Shyamalan a chance to work with his longtime idol. After the film fell through, Shyamalan later said it was too "tricky" to arrange and "not the right thing" for him to do. 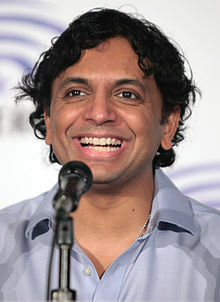 Shyamalan followed The Sixth Sense by writing and directing Unbreakable, released in 2000, which received positive reviews and commercial success. Shyamalan's name was linked with the 2001 film Harry Potter and the Philosopher's Stone, but it conflicted with the production of Unbreakable. In July 2006, while doing press tours for Lady in the Water, Shyamalan had said he was still interested in directing one of the last two Harry Potter films: "The themes that run through it...the empowering of children, a positive outlook...you name it, it falls in line with my beliefs", Shyamalan said. "I enjoy the humor in it. When I read the first Harry Potter and was thinking about making it, I had a whole different vibe in my head of it". His 2002 film Signs, where he also played Ray Reddy, gained both critical and financial success. His next movie The Village (2004) received mixed reviews from the critics, but turned out to be a financial success. After the release of The Village in 2004, Shyamalan had been planning a film adaptation of Yann Martel's novel Life of Pi with 20th Century Fox, but later backed out so that he could make Lady in the Water. "I love that book. I mean, it's basically [the story of] a kid born in the same city as me [Pondicherry, India] — it almost felt predestined", Shyamalan said. "But I was hesitant because the book has kind of a twist ending. And I was concerned that as soon as you put my name on it, everybody would have a different experience. Whereas if someone else did it, it would be much more satisfying, I think. Expectations, you've got to be aware of them. I'm wishing them all great luck. I hope they make a beautiful movie". Released in 2006, Lady in the Water performed worse critically and financially than his previous films. The film The Happening (2008) was a financial success but also received negative reviews. In 2010, he directed The Last Airbender, based on the Nickelodeon TV series Avatar: The Last Airbender. It received extremely negative reviews in the United States and won five Razzie Awards, but it made nearly $320 million internationally at the box office. In July 2008, it was announced that Shyamalan had partnered with Media Rights Capital to form a production company called Night Chronicles. Shyamalan would produce, but not direct, one film a year for three years. The first of the three films was Devil, a supernatural thriller directed by siblings John and Drew Dowdle. The script was written by Brian Nelson, based on an original idea from Shyamalan. The movie was about a group of people stuck in an elevator with the devil, and starred Chris Messina. The film was not previewed by critics before its release, eventually receiving mixed reviews. Devil was not a blockbuster hit, but has become a commercial success relative to its budget. The next film in the Night Chronicles series will be called Reincarnate. It will be scripted by Chris Sparling and directed by Daniel Stamm. In 2013, Shyamalan directed the film After Earth, based on a script by Gary Whitta and starring Will Smith and Jaden Smith. It was received poorly by critics, with Rotten Tomatoes giving the film a score of 11% based on 180 reviews. Shyamalan announced in January 2014 that he would be working again with Bruce Willis on a film titled Labor of Love. By November of that year, Universal had picked up rights to a low-budget movie called The Visit that Shyamalan had shot in secret. The movie went on to become a relative critical and financial success. Universal released the movie on September 11, 2015. In 2016 TNT first announced that Shyamalan would be responsible for a reboot series for Tales from the Crypt. As of June 2017[update] the series has been cancelled due to a number of legal reasons. In 2017, Shyamalan released the movie Split, which garnered positive reviews and was a huge financial success. In 2019, he released Glass as a sequel to his previous films Unbreakable and Split. The movie grossed over $240 million worldwide and received mixed reviews from critics. In 2004, Shyamalan was involved in a media hoax with Sci-Fi Channel, which was eventually uncovered by the press. Sci-Fi claimed in its "documentary" special The Buried Secret of M. Night Shyamalan, shot on the set of The Village, that as a child, Shyamalan had been dead for nearly a half-hour while drowned in a frozen pond in an accident, and that upon being rescued he had experiences of communicating with spirits, fueling an obsession with the supernatural. In truth, Shyamalan developed the hoax with Sci-Fi, going so far as having Sci-Fi staffers sign non-disclosure agreements with a $5 million fine attached and requiring Shyamalan's office to formally approve each step. Neither the childhood accident nor a supposed rift with the filmmakers ever occurred. The hoax included a nonexistent Sci-Fi publicist, "David Westover", whose name appeared on press releases regarding the special. Sci-Fi also fed false news stories to the Associated Press, Zap2It, and the New York Post, among others. After an AP reporter confronted Sci-Fi Channel president Bonnie Hammer at a press conference, Hammer admitted the hoax, saying it was part of a guerrilla marketing campaign to generate pre-release publicity for The Village. This prompted Sci-Fi's parent company, NBC Universal, to state that the undertaking was "not consistent with our policy at NBC. We would never intend to offend the public or the press and we value our relationship with both." Robert McIlhinney, a Pennsylvanian screenwriter, sued Shyamalan in 2003, alleging similarities between Signs and his unpublished script Lord of the Barrens: The Jersey Devil. In 2004, Margaret Peterson Haddix claimed that The Village has numerous similarities to her young adult novel Running Out of Time, prompting discussions with publisher Simon & Schuster about filing a lawsuit. In response to both allegations, Disney and Shyamalan's production company Blinding Edge issued statements calling the claims "meritless". Orson Scott Card has claimed that many elements of The Sixth Sense were plagiarized from his novel Lost Boys, although he has said that enough had been changed that there was no point in suing. Shyamalan married Dr. Bhavna Vaswani, a fellow student whom he met at New York University. The couple have three daughters. His production company, Blinding Edge Pictures, is located in Berwyn, Pennsylvania. Blinding Edge has produced The Happening, Lady in the Water, The Village, Signs, Unbreakable, The Last Airbender, After Earth and The Visit. It is run by Shyamalan and Ashwin Rajan. His cousin is actor Ritesh Rajan. Shyamalan is a season ticket holder of the Philadelphia 76ers. 2007 Entourage No No Yes Himself Episode: "Sorry, Harvey"
2015–2016 Wayward Pines Yes Yes No Episode: "Where Paradise Is Home"
After the release of The Village, Slate's Michael Agger noted that Shyamalan was following "an uncomfortable pattern" of "making fragile, sealed-off movies that fell apart when exposed to outside logic." Shyamalan has also won numerous Golden Raspberry Awards for Worst Director, Worst Screenplay, and Worst Film in 2006 and 2010, while being nominated in 2008 for The Happening and 2013 for After Earth. In 2016 he was also nominated for The Razzie Redeemer Award. In 2008, Shyamalan said it was a common misperception "that all [his] movies have twist endings, or that they're all scary. All [his] movies are spiritual and all have an emotional perspective." While working on his film The Happening, Shyamalan developed an interest in improving the delivery of education in American schools. He hired doctoral student James Richardson to do most of the background research and as a result published I Got Schooled: The Unlikely Story of How a Moonlighting Movie Maker Learned the Five Keys to Closing America's Education Gap. ^ a b Huber, Robert; Wallace, Benjamin. The Philadelphia Reader. Temple University Press. p. 197. Then [Shyamalan] changed his name. The idea came when he was applying for American citizenship at age 18. ^ "NLS: Say How, Q-T". Library of Congress. Retrieved April 20, 2017. ^ "Padma Shri Awardees". india.gov.in. National Informatics Centre, Government of India. Archived from the original on September 30, 2009. Retrieved November 1, 2017. ^ "The need for a Dev Patel in the Life of Pi". Rediff. February 20, 2009. Archived from the original on March 4, 2016. ^ Bamberger, Michael. The Man Who Heard Voices: Or, How M. Night Shyamalan Risked His Career on a Fairy Tale. (Gotham Books, New York, 2006), p. 150. ^ "Dr. Nelliate Shyamalan, MD - Wynnewood, PA - Internal Medicine - Healthgrades.com". ^ "Biography - M. Night Shyamalan Online". www.mnight.com. Retrieved October 22, 2017. ^ Shyamalan, M. Night (July 12, 2010). "10 Questions for M. Night Shyamalan" – via content.time.com. ^ Edelstein, David (July 16, 2006). "nymag.com". nymag.com. Retrieved July 23, 2012. ^ Edelstein, David (July 16, 2006). "M. Narcissus Shyamalan". New York Magazine. Retrieved April 27, 2010. ^ Young Artists Award Archived September 7, 2013, at the Wayback Machine - Past Nominations Listing. ^ Crossan, Jamie (June 11, 2013). "M Night Shyamalan reveals he ghost-wrote 'She's All That'". NME. Retrieved July 16, 2018. ^ Kibblesmith, Daniel (June 17, 2013). "Wait, did M. Night Shyamalan lie about writing "She's All That"?". Retrieved October 5, 2013. ^ Premiere.com - "Indiana Jones and the Curse of Development Hell", By Ann Donahue Archived June 18, 2007, at the Wayback Machine. ^ Otto, Jeff (July 14, 2006). "Potter in the Water? Shyamalan interested in magical franchise". IGN. ^ Schwawrtz, Missy (May 3, 2006). "'Water' Bearer". Entertainment Weekly. ^ Fleming, Michael (July 21, 2008). "Night falls for Media Rights". Variety. ^ Fleming, Michael (October 28, 2008). "MRC, Shyamalan dance with 'Devil'". Variety. Retrieved January 3, 2009. ^ "Details on Shyamalan Story 'Devil'". Retrieved October 19, 2009. ^ "M. Night Shyamalan And Bruce Willis Will Reteam For Labor Of Love". January 29, 2014. ^ a b Fleming, Mike, JR. "Universal Slots 'The Visit', M. Night Shyamalan's Secret Thriller". Deadline. Retrieved November 14, 2014. ^ "Profile of M. Night Shyamalan goes sour: Sci-Fi Channel is still planning to air the documentary". Today. Associated Press. June 16, 2004. Archived from the original on April 1, 2015. ^ "Sci Fi schedules controversial Shyamalan doc". Zap2it.com. Knight Ridder / Tribune News Service. June 21, 2004. Archived from the original on April 2, 2015. Retrieved April 1, 2015. ^ Edelstein, David (n.d.). "M. Narcissus Shyamalan". (Sidebar, "Backstory") New York. Archived from the original on July 19, 2006. ^ Starr, Michael (June 23, 2004). "Starr Report". New York Post. Archived from the original on April 1, 2015. Retrieved April 1, 2015. ^ Recchia, Philip (January 2, 2005). "Let's Be Honest! Who Were the Biggest Liars of 2004?". New York Post. Archived from the original on April 1, 2015. Retrieved April 1, 2015. ^ Collins, Dan (July 20, 2004). "Sci-Fi Channel Admits Hoax, 'Documentary' On Reclusive Filmmaker Is Bogus". CBS News. Associated Press. Archived from the original on January 10, 2011. ^ a b Grossberg, Josh (August 10, 2004). "Shyamalan's "Village" Villainy?". eonline.com. ^ a b "Is Shyamalan a copycat?". Rediff Entertainment Bureau. August 11, 2004. ^ a b Susman, Gary (August 10, 2004). "It Takes a Village". ew.com. ^ Humphries, Stephen (July 28, 2004). "A Different Take". The Christian Science Monitor. Archived from the original on January 2, 2015. ^ Colman, David (May 31, 2012). "M. Night Shyamalan's Pennsylvania Estate". Architectural Digest. Archived from the original on June 2, 2016. Retrieved June 2, 2016. ^ "Legal". M. Night Shyamalan official site. Archived from the original on December 23, 2013. Retrieved April 1, 2015. ^ "Blinding Edge Pictures". YellowPages.com. Retrieved April 1, 2015. ^ "Syfy, Marti Noxon, M. Night Shyamalan and Universal Cable Productions Team for Proof Pilot" (Press release). Syfy. August 3, 2012. Archived from the original on July 23, 2013. Retrieved April 1, 2015. ^ "M. Night Shyamalan Is Attending Sixers Opener With Connor Barwin". Pricewaterhouse Coopers. October 26, 2016. Retrieved July 30, 2017. ^ "The case against M. Night Shyamalan". slate.com. July 30, 2004. ^ Rosen, Christopher (January 13, 2016). "Razzies nominations 2016: 50 Shades of Grey, Pixels lead pack of year's worst". Entertainment Weekly. Retrieved March 30, 2019. ^ "The 5-minute Interview: M Night Shyamalan, Writer and director". The Independent. London. May 31, 2008. Retrieved May 12, 2010. ^ "Wide Awake". Rotten Tomatoes. Retrieved December 15, 2018. ^ "The Sixth Sense". Rotten Tomatoes. Retrieved December 15, 2018. ^ "The Sixth Sense". Metacritic. CBS Interactive. Retrieved December 15, 2018. ^ "Unbreakable". Rotten Tomatoes. Retrieved December 15, 2018. ^ "Unbreakable". Metacritic. CBS Interactive. Retrieved December 15, 2018. ^ "Signs". Rotten Tomatoes. Retrieved December 15, 2018. ^ "Signs". Metacritic. CBS Interactive. Retrieved December 15, 2018. ^ "The Village". Rotten Tomatoes. Retrieved December 15, 2018. ^ "The Village". Metacritic. CBS Interactive. Retrieved December 15, 2018. ^ "Lady in the Water". Rotten Tomatoes. Retrieved December 15, 2018. ^ "Lady in the Water". Metacritic. CBS Interactive. Retrieved December 15, 2018. ^ "The Happening". Rotten Tomatoes. Retrieved December 15, 2018. ^ "The Happening". Metacritic. CBS Interactive. Retrieved December 15, 2018. ^ "The Last Airbender". Rotten Tomatoes. Retrieved December 15, 2018. ^ "The Last Airbender". Metacritic. CBS Interactive. Retrieved December 15, 2018. ^ "After Earth". Rotten Tomatoes. Retrieved December 15, 2018. ^ "After Earth". Metacritic. CBS Interactive. Retrieved December 15, 2018. ^ "The Visit". Rotten Tomatoes. Retrieved December 15, 2018. ^ "The Visit reviews". Metacritic. Retrieved December 15, 2018. ^ "Split (2016)". Rotten Tomatoes. Fandango Media. Retrieved December 15, 2018. ^ "Split reviews". Metacritic. Retrieved December 15, 2018. ^ "Glass (2019)". Rotten Tomatoes. Fandango Media. Retrieved January 12, 2019. ^ "Glass reviews". Metacritic. Retrieved January 9, 2019.